With wireless charging, the current standard being followed is the 10W Qi wireless charging. This fast wireless charging is currently available for the latest Galaxy smartphones. Even if we thought that 10W was fast enough, Texas Instruments brings us 15W of wireless charging power. Texas Instruments currently offers Qi wireless charging transmitters at all the other speeds; namely 2.5W, 5W, and 10W power outputs. Now, a new faster speed of 15W is available for manufacturers. This wireless transmitter needs 15V to 19V of power to output the desired 15W. It is also backwards compatible with the past speeds, reaching as low as 5V of input. So no need to fret, your device currently offers the lower speeds. Simply using the new Qi wireless charging transmitter won’t fry your lovely smartphone. The Qi wireless charging transmitter is a thin 9 x 9mm quad flat no-lead package, available for manufacturers to purchase. 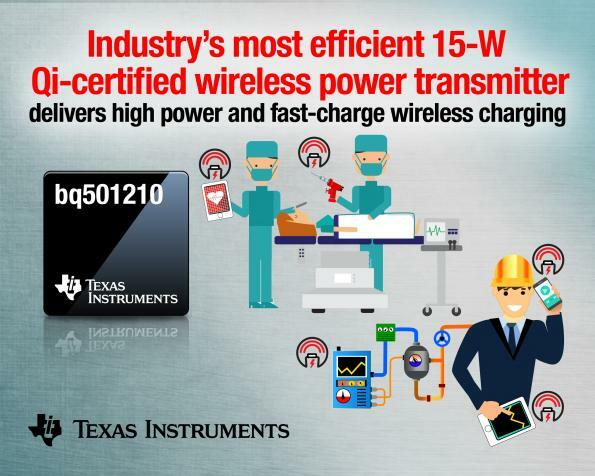 Texas Instruments has priced their new bq501210 15W Qi wireless charging transmitter at $3.75 each for a 1,000 bulk purchase.